For a long time it seems that, when it comes to retail, the focus has been almost exclusively on e-commerce. It's easy to see why: e-commerce is relatively new and exciting, and its growing quickly. It's just as easy to forget, though, that the vast majority of shopping is still done in person. Somewhere around 90% of all commerce still takes places in brick and mortar stores. Those storefronts need to ingrate these new types of technology to continue to compete, and in the last few years there have been a subset of companies that have emerged to help out this huge, but largely ignored, sector. 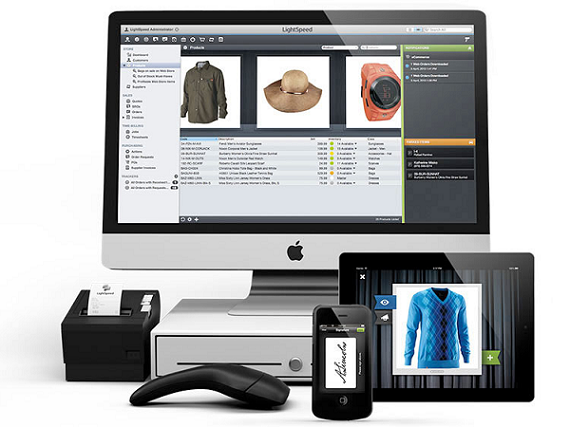 One of those companies is LightSpeed, the provider of a point-of-sale software for storefront retailers. The company has just raised $35 million in new funding, it was announced on Wednesday. The round was led by Canadian investment firm iNovia Capital, and previous investor Accel Partners. The company has previously raised a $30 million round in June of 2012, and this round brings its total funding to $65 million. The Montreal-based LightSpeed provides retailers with tools to help them build, manage and grow their business, and also to create a better shopping experience. It supplies them with inventory control, which allows them to track their stock, submit purchase orders, and set up automatic re-order points. They can also sync their existing inventory to their integrated Web store, connect with suppliers and generate analytics. The idea is to allow brick and mortar retailers, specifically those in verticals such as cothing, bikes, pets and electronics, to compete in an increasingly e-commerce world, and help stores bring their experience to the next level. "There's a real shift happening in retail, where the online and offline worlds are merging," Dax Dasilva, CEO of LightSpeed told me in an interview. "Independent retailers have all of this expectation upon them to have the most amazing in store experience, and to be online, and to employ mobile devices in stores. We help them meet customers expectations of what retail engagement looks like." For example, one of LightSpeed's customers is DASH, the clothing stores owned and operated by the Kardashians. By using LightSpeed, the stores can put their product info into the cloud, and update it when customer shops in one store or when they buy online. Sales associates are given iPads to that they can interact with customers that walk in, and they are automatically armed with inventory info, including what's coming in. And the service also helps out in the back office, where \store managers can see what's trending, what's sitting on shelves and which customers to reach out to with certain brands. "We are helping them operate the back office in a whole new way," said Dasilva. "We let the retailer feel like they are two steps ahead, and let them put money and time into the right efforts and stock." The company will use the new funding toward hiring and expansion. In just the last two years, LightSpeed has gone from 50 employees to 200, and Dasilva says its possible that it could double that number. The company is in the process of moving to a new office space in Montreal, and will be filling out roles in the engineering department, adding developers and product people, as well as sales support and operations. The company will also use the funding for international expansion. Currently, 85% of its operations come from North America, but it has also seen a lot of demand overseas, specifically in Europe and Asia. The most likely places that it will look to expand to first are Australia and the United Kingdom. "We have the rare opportunity to be a global brand for retail," Dasilva said. "We have footholds in many places, and we'd like to see greater global operations." Finally, the funding will also go toward the launch of LightSpeed's new, integrated payments platform called LightSpeed Payments, which it also announced on Wednesday. Through a partnership with Element Payment Services, a Vantiv company, retailers will be able to set up their store with one call, get complete visibility into all transactions and better manage cash flow. The new service will eliminate the need for retailers to deal with a third party in order for them to begin accepting credit and debit cards. The company also said it will offer a flat-rate pricing model, as well as support for Apple Pay, the new NFC payment app that Apple launched last week. "Our average retailer does half a million in sales a year, a lot more than a Square customer.They have significant inventory and low risk, and they deserve better rates for their profile," Dasilva told me. "Our vision to be a one stop shop for retailers. In the past we've been referring retailer to to processing partners, but we want to create a tailored offering that gives them both better rates and also integration into point of sale to allow them to have deeper insight into their business." LightSpeed is currently used by more than 20,000 stores in 30 countries, who collectively process over $7.5 billion in transactions annually by using LightSpeed's retail commerce platform. Customers include Adidas, Harman, Leica, and DASH. Founded in 2005, the company has offices in New York City,Olympia, Ottawa, and Santa Cruz. "This second round of funding is a big bet, and a big vote of confidence, in brick and mortar. That’s an exciting thing for brock and mortar retail," Dasilva said. "It's a tough environment for all small businesses, and we want to help the dreamer that’s passionate about a certain type of merchandixe, who wants to their share vision." "This round as much about this store owner as it is about LightSpeed."